When starting out in the film industry, the norm is to make short films. These films cost less and are easier to manage than their feature length counterparts, and are a great way for people just starting out to get their feet wet. There’s no rule that says one must make a certain number of shorts before attempting a feature, but it seems that three is the average. Throughout my indie film travels though, there have been a distinct few who dive right into the deep end, and almost immediately attempt to make a feature film. Whether or not the end results are all that good, I admire their ambition, courage and efforts. Filmmaker Sam Vanivray is just such an audacious young talent. While Sam has had numerous acting roles since 2011 when he got his start, it wasn’t until 2015 that he took a chance on making his own film. The result of that chance is the short Enough to be Dangerous. The film is long for a short, with a 34 minute runtime, but it’s a great example of Sam’s ingenuity. Upon the completion of Enough to be Dangerous Sam began work on his first feature, Brute Sanity. The film is an ambitious one, with over 100 scenes, multiple special effects and CGI peppered throughout; it’s the type of film that even some more experienced filmmakers wouldn’t dare make. Its synopsis is an intriguing one: “An FBI-trained neuropsychologist teams up with a thief to find a reality-altering device, while her insane ex-boss unleashes bizarre traps to stop her.” What it doesn’t mention is that the reality-altering device is an ancient alien artifact. If that doesn’t pique you’re interest, I don’t think anything will! 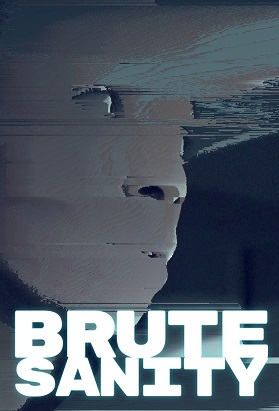 You may recall that about a year ago I wrote a preview of Brute Sanity based on the film’s trailer and press kit, as well as some questions I posed to Sam. Reading back over it there is very little substance there, but that’s only because Sam was reluctant to give me any sort of insight. Now that I’ve seen the film though, I’m glad he held out. The first time I saw it was several months ago. Sam warned me that the version I’d be watching was not the final cut, but he wanted to be sure I saw it so I could admit it to my new monthly film series. It was rough. The story was all there, but some of the special effects and music levels needed work, as well as the talking vs. background noise in some scenes. It had potential, but it was definitely in need of more editing. Then,on April 13, a group of around 25 people, including myself, were treated to a more complete version of Brute Sanity. The differences between this version and the first I had seen were enormous. In the interim it seems Sam had been hard at work smoothing the rough spots, fixing the audio and touching up the multiple CGI effects in the film. Having never been involved in the process of editing a film before, I really got a sense of how daunting a task this film was to make,through seeing both versions and in talking to Sam about some of the difficulties he encountered. If nothing else, seeing Brute Sanity has given me a new appreciation for special effects editors out there! “But enough about the technical aspects!” I hear you yelling. “How was the film itself?” Well, I’m glad you asked. This film is as action packed and plot twisting as any big budget feature. It’s an absolute thrill ride from start to finish that will keep you engaged the whole way through. It’s a fantastic sci-fi adventure that is suitable for even the most discerning tastes. And it will keep you guessing long after it’s over. But really, my praise doesn’t do it justice. Here’s what Sam hopes people get from it, “I would love it if people saw the underlying principle that humans don't perceive reality—this is a legitimate academic philosophical and also scientific issue. Importantly, it does not mean there's no objective reality, just that we don't have a truthful perception of it,” he said. If that doesn’t whet your appetite, nothing will! BruteSanity is not rated, was written, directed, edited and more by Sam Vanivray and stars Adjovi Koene, Steven Lawlor Jones and Sam Vanivray. It is currently making the festival rounds, so keep an eye out for a screening near you!